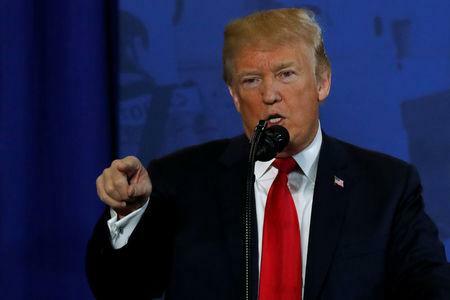 WASHINGTON (Reuters) - U.S. President Donald Trump sent greetings on Monday to Iranians celebrating the New Year's holiday known as Nowruz, but used the message to attack Iran's government, particularly its powerful Islamic Revolutionary Guard Corps. "I wish a beautiful and blessed Nowruz to the millions of people around the world who are celebrating the arrival of spring," Trump said. He added, however, that the Iranian people were burdened by "rulers who serve themselves instead of serving the people." Trump, who has threatened to pull Washington out of a multilateral deal with Tehran to curb its nuclear program, called the Revolutionary Guard "a hostile army that brutalizes and steals from the Iranian people to fund terrorism abroad." Trump said in the statement the Guard had spent more than $16 billion to prop up Syria's government and support militants and terrorists in Syria, Iraq and Yemen. He also accused the group of impoverishing Iran's people, damaging its environment and suppressing civil rights. The harsh language contrasted with Trump's Nowruz statement last year, which made no mention of politics. In January, Trump delivered an ultimatum to the European signatories of the 2015 nuclear accord, which aimed to curb Iran's nuclear program in return for lifting various trade and economic sanctions. The Republican president said they must agree to "fix the terrible flaws of the Iran nuclear deal," which was agreed to under his Democratic predecessor, Barack Obama, or he would refuse to extend U.S. sanctions relief on Iran. U.S. sanctions will resume unless Trump issues new "waivers" to suspend them on May 12. Iran has said that if Washington pulls out of the deal, it will no longer abide by its terms. In a bid to persuade Washington to remain in the nuclear accord, France urged the European Union on Monday to consider new sanctions on Iran over its involvement in Syria's civil war and its ballistic missile program. Nowruz is Iran's most important national event and is celebrated with family gatherings, vacations and gift-giving. It is also celebrated by millions around the world, including in Turkey, Iraq and parts of South and Central Asia.